That’s right. I said it. A skulls and hearts jumper. Only the great and powerful Ozma would even contemplate such a thing. I’m probably the only person that would wear this to a baby shower, too. That’s right. I said “baby shower”. Because that’s just how I roll. Shut up, you just wish you were as cool as me. First, I blame Catholic School. Why? Because I wore a jumper every day of my life for an entire year. It warps you. So if your school is considering uniforms, really think long and hard if you want to support that decision. I will say, my uniform jumper did not look near as awesome as my skulls and hearts jumper. What really could come compare? Third, I blame the lovely friend that gave me the skulls and hearts fabric. Guess whose baby shower I attended? Yeah, I think she asked for it as well. Fourth, well I just blame me and my warped brain. Let’s face it, I have a passion for these skull skirts! It may or may not be healthy. I studied the pin for inspiration. I realized the skirt was nothing more than a circular style skirt with a yoke. Hello, I made one of those with my first skull skirt. Of course, many of these steps are like what I’ve done in the past, so there wouldn’t be much new to show anyway. Step 2: I looked at my fabric and determined I only had enough for a half circle skirt, so I used my already prepared pattern from The Math Skirt. Step 3: I cut out and made the math skirt without sewing up one side giving me a skirt that would sit at my waist when completed. Step 4: I cut a rectangular piece as long as my waist plus a few inches for the zipper and seam allowance and ease. Here’s where I messed up, however. In order to make a yoke, you need to determine how wide you want your yoke to be, and then cut to that if you have a lining. If you are folding over, you need to double that width measurement. I wanted mine to end up six inches to make this an underbust jumper like the pin I originally saw. Unfortunately, I had a headache, been sewing for two days, under a time constraint, and talked to a kid while doing this. Translation: I cut my piece six inches wide. Oooops. So much for six inches, I really needed to line it or go with a less wide, folded over yoke, that really turned into a wide waistband. 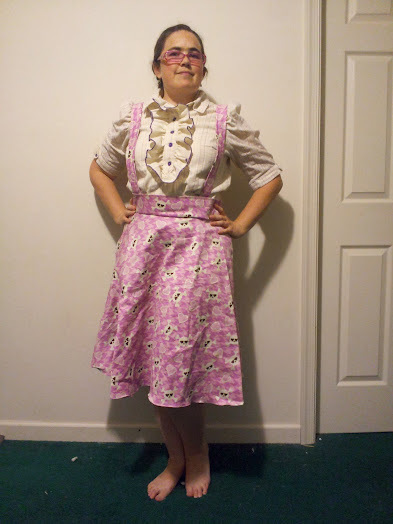 Instead of resulting in an underbust, I ended up with a high waist skirt. That’s OK, those are popular enough anyway. I went with it, though I had enough fabric to fix the mistake. Just remember that. Step 5: After cutting my rectangular piece 6 inches wide and my waist plus two inches long, I folded this piece in half lengthwise and pressed flat. Step 6: I serged this closed, put a top stitching at the top fold, and then attached the new waistband to the waist of the skirt. Step 7: I used my narrow hem foot and gave my skirt a proper hem. This was only the second time I’ve ever used that foot and it took forever. Step 8: I measured where my zipper would fall, closed up the last seam and added the zipper. Step 9: I measured how long my two straps needed to be and cut them at 4 inches wide. Step 10: I folded the straps inside-out along the length and pressed the fabric. I then serged the straps and flipped them right side out and pressed-flat once again. Step 11: I put a top stitch down each side to ensure my straps held their form and attached them inside of the waistband at the seam where the waistband met the skirt. Egads, it got wrinkly. But it still looks awesome! I need to find some cute buttons for accent pieces, but have not found any yet. Maybe at Halloween? Verdict: Mama-to-be LOVED the outfit. I think it’s super fun. Though my frilly Victorian blouse features a darker purple than the jumper actually uses, I still thought the combination was a good one. I think this turned out great! What do you think? What? Upset I didn’t mention the narrow hem? It’s coming up in a blog I still have yet to write. That project needed some extra work so I could not blog about it yet. Sorry. I will definitely go over this with photographs! Why do I add all that extra top stitching? I think it makes a piece more finished. First, it looks nice. Second, I think it helps the fold not bubble or get all wonky in the wash. Third, it gives the garment a little extra support. For the record, I just place my fold/edge at the very edge of my standard sewing machine foot and use that as a measurement. Nothing fancy! Let me know what you think? I happen to love it! I’ll likely wear it a lot in October and to conventions. Think it is worthy of every day wear? Extreme cuteness here – I think your ‘sewing without pattern’ skills have WAY advanced! Seriously – jumper looks great, so do you!!! And I love that you wore this to a BABY shower. Church? – sometime when you actually get to attend our ward! I feel like my skills are improving. Which is good because I have something I want to make that I have no pattern for so I need better skills. Thank you for the compliment.